The competition in the online music streaming business is intensifying, however, two services seem to currently be head to head when it comes to popularity. On the one hand, you have Spotify music while on the other you have the very successful Pandora radio. On the surface it may seem like both these services have a lot in common, and they do to some extent, but they are vastly different in what they offer to their customers. We'll be taking a closer look at the similarities and the differences of these hugely successful music streaming services to help you pick the winner for yourself. While both these services provide music streaming they do it in very different ways. Spotify can be considered a more mainstream music streaming service which lets you pick the songs, albums, and artists you want to listen to. Many other streaming services have tried to copy the business model of Spotify because it does seem to be very popular. Pandora, on the other hand, can be classified as a music discovery platform or a very large radio platform. While you can pick the songs and artists you like on Pandora, you can't choose the songs you listen to. They stream songs from new artists they think you will like based on the preferences set by you. While this could lead to some frustrating times the Music Genome Project by Pandora App is pretty good at giving you what you like. 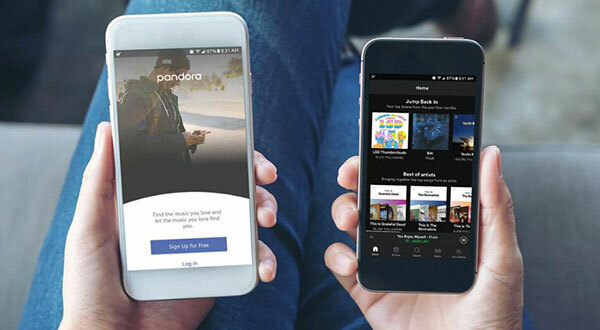 Both Pandora and Spotify have mobile apps for Android and iOS. The Pandora app is limited in its availability though. It's only available in the US, Australia, and N.Z. What makes the Spotify app so popular is that it is available in several countries around the world. It also supports a variety of other operating systems like Blackberry, and Windows Mobile. Both these services also provide web applications in case you want to listen to songs on your desktop or laptop. However, the Pandora desktop app is only available for its premium users. This is what really set apart the community of both these services. The ability to build playlists. While both platforms technically allow playlists they're vastly different in their styles. Since Pandora radio is more like a music discovery service it doesn't let you build traditional playlists. What I mean by that is, there is no way for you to pick and drop a song to build a single playlist for yourself. It has been argued that each radio station on Pandora is technically a playlist but that's not exactly what users are looking for. People who use Pandora love it because it provides them with an opportunity to find new and exciting music which they would not likely have discovered themselves. You can only create a 100 different "Pandora Playlists" which is the limit. The Spotify playlist users are those who are more set in their musical tastes. They know what songs they like, which artists they like and would like to be able to customize their own playlist. Spotify allows you to curate individual playlists of songs and queue them as per your requirement. Not only can you create the playlists, but you can also share them with your friends and work on playlists together. The sky is the limit when it comes to the number of playlists you can create on Spotify. Because it has to cater to the musical tastes of such a variety of people the music library of Spotify is absolutely extensive. Unofficial number state that they have over 40 million songs in their database of not only popular bands and artists but a lot of underground and independent labels as well. It should be noted, however, that the number of songs available in each of its markets will vary depending on the distribution and licensing deals they have made. Pandora radio is more into the business of providing listeners with new bands, new songs, so their music library isn't as vast. They do have more than a million songs in their database but many of these songs are from obscure bands that you've probably never heard of before. Which isn't necessarily a bad thing. They make early deals with independent labels and usually try and find the diamonds in the rough. Both music streaming services Spotify and Pandora rely on ads in their free versions to pay for the content. However, if you don't like having ads interrupt your music streaming you can always get the premium versions of the services. The Spotify paid subscription is called Spotify Premium. While it costs users $9.99 a month, it provides its users with a lot of benefits the least of which is playing music without ads. Premium users can download songs, listen to songs at a better quality than the free version, can create and distribute unlimited playlists and there is no restriction on skipping songs if you don't like them, unlike the free version. If you want to download Spotify songs without Premium, you can use the third party DRmare Spotify Music Downloader for Windows/Mac. The Pandora radio paid subscription is known as Pandora One. You need to pay $4.99 a month to avail the services. While the paid subscription does get rid of the ads there are still restrictions on the song skipping. You're only allowed 30 song skips every day or 6 every hour. You do get a higher audio bitrate on the paid version which adds a quality aesthetic to the songs. Spotify is also king when it comes to the social features the apps have. While Pandora allows you to share stations via, email, Facebook, and Twitter you cannot easily share individual songs. You can share song like but they direct to a page with the song, artist info rather than providing you with a chance to listen to the song. Spotify not only allows you to share playlists, but you can even share individual songs. You can even get together with friends and co-create a playlist. Spotify has special in-app links for sharing that are now being commonly used by websites to legally share songs. With the difference laid out, it can be much easier for you to decide if you'll like Pandora radio better or Spotify music. While Pandora gives you an opportunity to listen to a variety of music, Spotify lets you listen to music you know you already like. If you don't mind the ads, you can easily listen to the free versions of both. Overall these are two extremely great music streaming services that provide a vastly different value proposition. In the battle of Spotify vs Pandora, which one do you prefer? Please do not hesitate to let's know on the comment area below.